As alert readers will have noticed, we’ve been riding bikes a lot this summer. I love riding bikes – not any downhill craziness, mind you – I prefer cruising on country roads or trails. 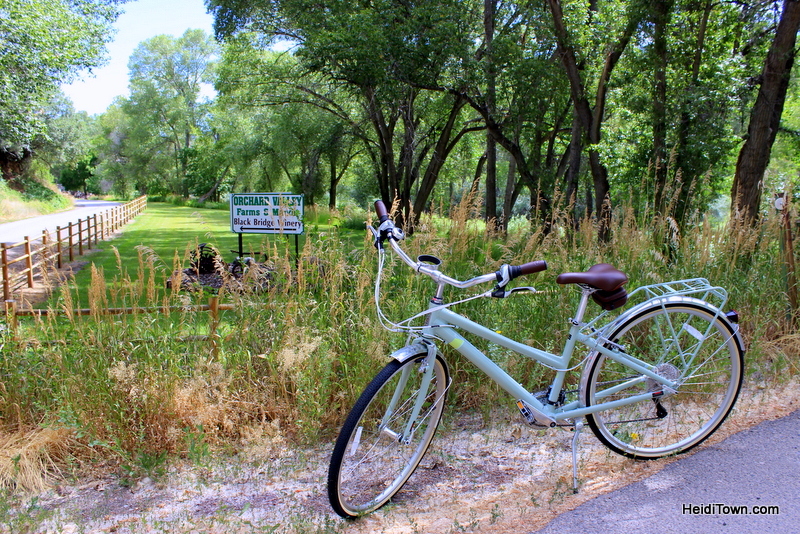 Earlier this summer we did a bike to farm outing in the North Fork Valley, located in Delta County, Colorado. This is the story. 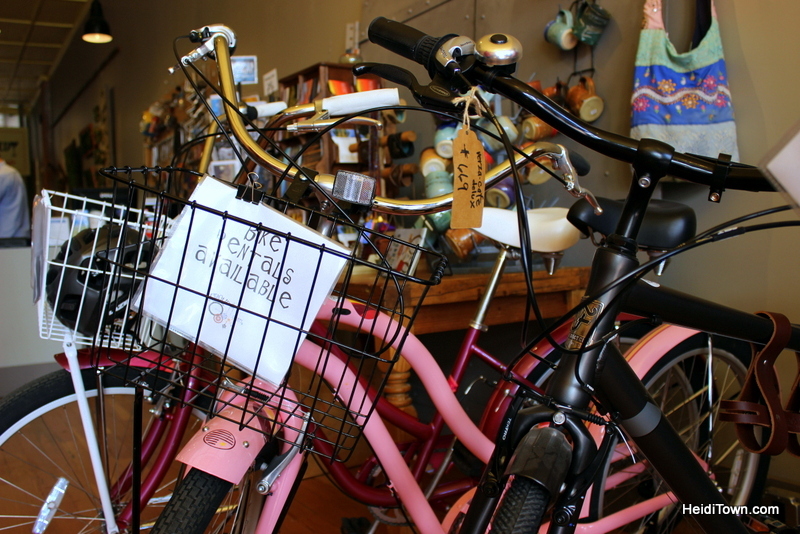 We rented bikes at Cirque Cyclery in downtown Paonia. A destination in and of itself, Cirque Cyclery is one of several awesome small businesses under the same roof. Cirque Cyclery rents and sells bicycles, plus unique clothing and gifts, Shish KaBikes repairs bikes and Remedy Juice Bar Cafe provides refreshments, including adult beverages. 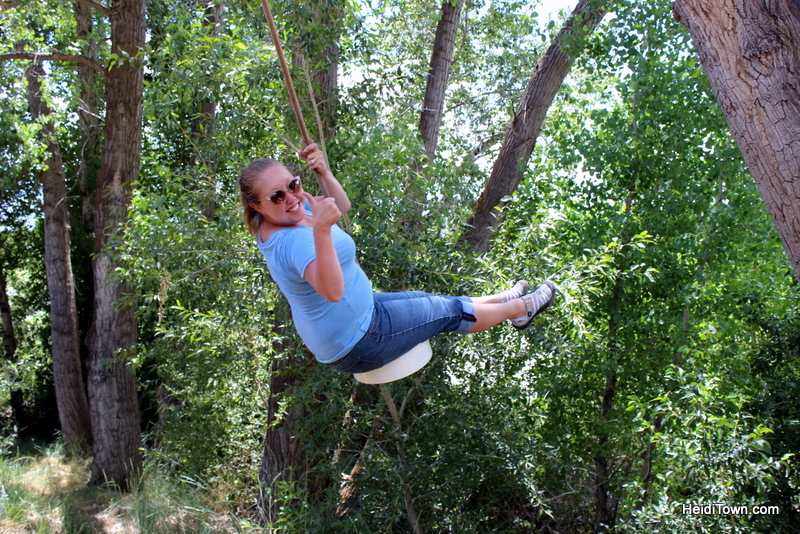 The entire place, which was formerly the Paonia Post Office, has a laid back, neighborly feel. We rented two Felt cruisers and Amy, one of the owners, helped us plan out a bike to farm tour. She can help you put together a bike to farm tour, or if you’d rather, a bike to winery tour. If you need a little pedaling assistance, ask about their electric bikes. Orchard Valley Farms was our first destination and we pedaled out of town through the gently rolling hills northeast of downtown. The two mile ride took us past farmhouses, open fields and wild-looking roadside trees weighed down with hundreds of apricots. 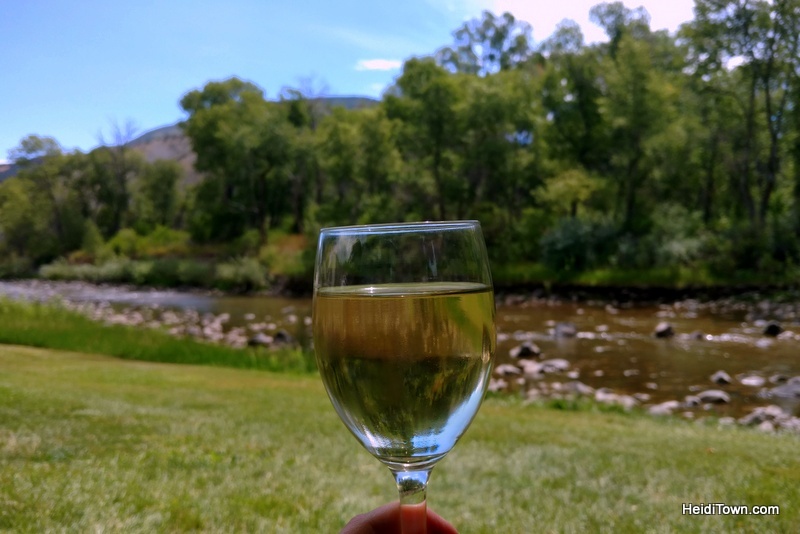 Orchard Valley Farms is nestled next to the North Fork Gunnison River. It is also home to Black Bridge Winery, named for the beautiful black bridge that crosses the river near the entrance to the property. Inside the farmer’s style market we tasted Black Bridge wines and oohed and awed over the crates of fresh fruit and shelves of local products like honey and jam. The market serve up hot French bread and guests can feast on bread and sip wine in comfy chairs by the river. 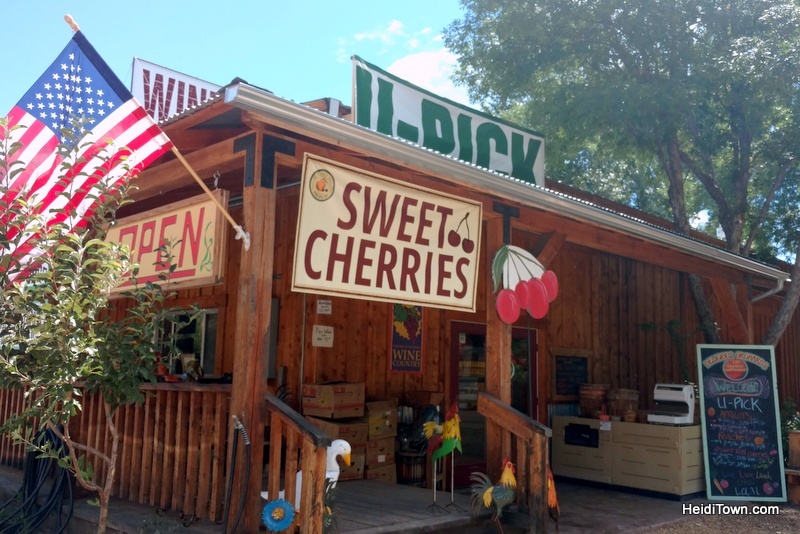 Hopping back on our bikes with a bag of peaches in the saddle bag, we set out to our lunch destination – Big B’s Delicious Orchards – one of our favorite spots in the North Fork Valley. It’s a farm, cafe, market and cidery. We rode back the way we’d come, and then from downtown Paonia turned towards Delicious Orchards. This was a four mile ride. 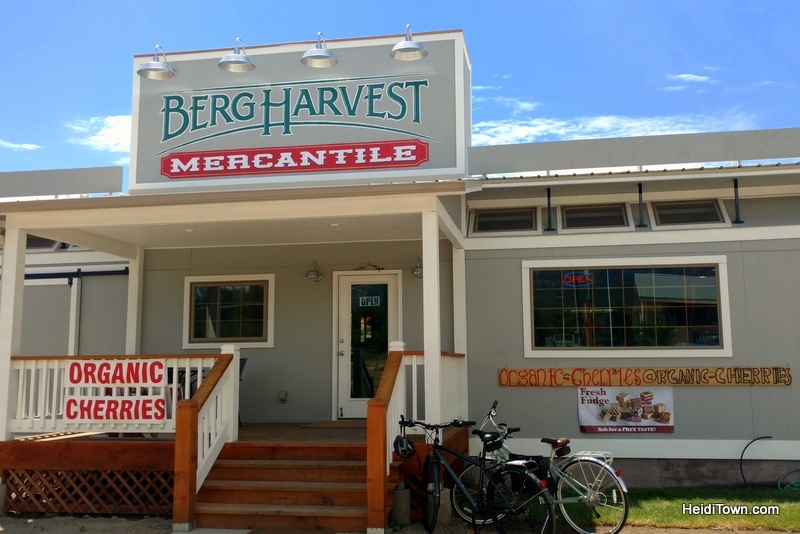 Along the way, we made a stop at the newest market in town, Berg Harvest, where we tasted a variety of cherries. We returned before our trip was over to purchase bags of Berg’s freshly picked cherries and homemade fudge. The place was crowded and the wait was long, but lunch at Big B’s Delicious Orchards didn’t disappoint, and it never does. 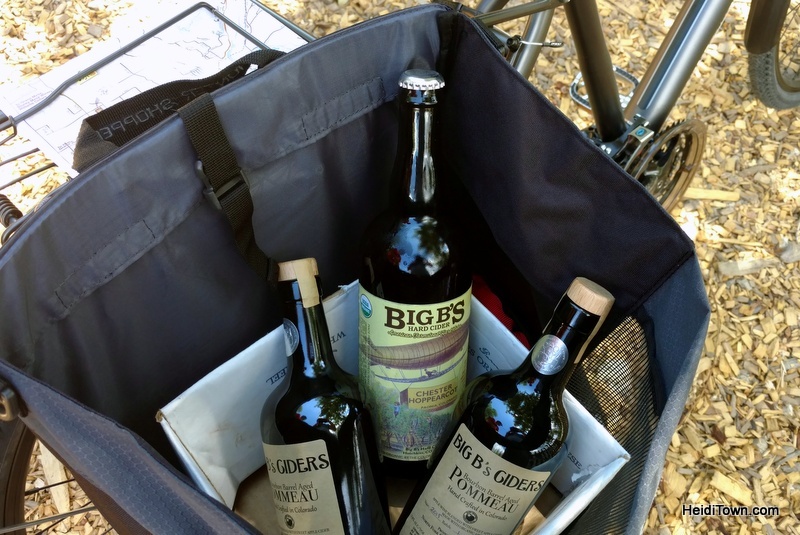 As we waited, we sipped Big B’s hard ciders and browsed the market, filling up Ryan’s bike’s saddlebags with his favorite, bourbon barrel pommeau. After a quick swing out in front of Big B’s we headed back to Cirque Cyclery, our bikes heavy laden with our morning’s bounty. The next day we stopped by Big B’s again to pick apricots. Delicious Orchards grows a variety of fruits and vegetables. See the list here. 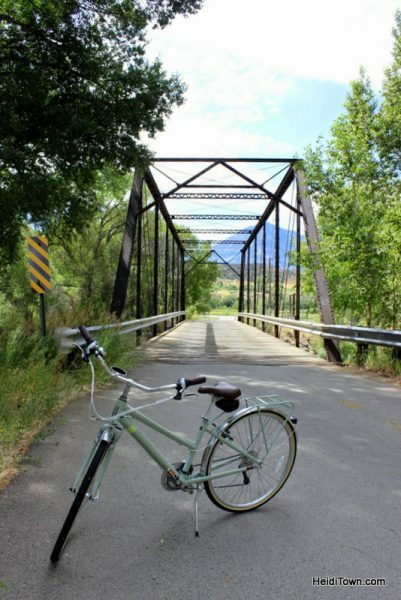 Whether you visit for Mountain Harvest Festival (September 22-25), or the 5th Annual Ciderfest (October 29), pack your bike or stop in at Cirque Cyclery and rent one. I guarantee that you’ll have a good time riding bikes in the North Fork Valley and I highly recommend doing a bike to farm tour. Thank you to Delta County Tourism for hosting us on this trip.